The sugar-white sands and emerald green waters that make up our coastline are hard to beat. That being said, you can't spend 100% of your time in a bikini and flip flops which begs the question, what do you do for entertainment when you're not at one of those perfect beaches? While you enjoy the village, stay a few extra days and enjoy the white sandy beaches, and even charter a boat for excellent fishing. While here, stay with us in an affordable vacation condo near Destin and South Walton. Enjoy! The Village of Baytowne Wharf is a 28-acre waterfront entertainment complex located in the Village District of the Sandestin Golf and Beach Resort. 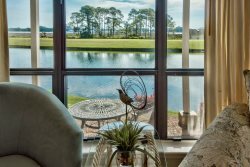 This bayside village is easily considered to be the heart and soul of Sandestin and luckily for us, it's open to the public year-round. Baytowne, as it's most often referred to, is considered the heart and soul of Sandestin because it's truly the pulse of activity on the resort and can be counted on for entertainment no matter the weather. The cobblestone streets amid the glow of the lamp posts mingle with the bridges and docks to set the stage for something exciting. When Baytowne was first established, it was developed by a Canadian company, Intrawest. Their vision was to create something that mimicked a ski village. The end result was the creation of a thriving mixed-use destination vacation village with residences, charming shops, award-winning restaurants and party-filled entertainment and nightlife – a true heart for the entire Destin region. As you enter the main gates and look directly ahead to the stage, with restaurants and unique shops and activities, scattered around you, you might think you were in some Colorado or Idaho ski town, were it not for the warm coastal breeze, summer dresses, flip-flops and seagulls. Vacationers and locals alike frequent Baytowne to experience a range of specialty cuisine. There aren't many vacation destinations in the US with this much variety, all within walking distance. Start with breakfast at Another Broken Egg where the ceramic coffee mugs are as much an event as the omelet's. You can grab pizza by the slice at Roberto's Pizzeria or a burger from the classic 50's Hartell's Village Diner. After dinner, walk over to Rum Runners, home of the "World Famous" Dueling Piano Players and enjoy all the hits from the '50s to today. The crowd especially livens up around football season where you will sometimes see people tip upwards of $100 to hear their team's fight song! From here, you can walk over to Fat Tuesday Daiquiri Bar, another spot made famous by New Orleans. Eventually, everyone meets up at John Wehner's Village Door, the area's only dedicated live music dance club. Sing along with The Dream Band and dance until you can't dance anymore with the high energy sets from the dj. This venue is open until 2:00 AM, 7 days a week and is sure to entertain everyone in your group. The Village of Baytowne Wharf has year round events and activities for everyone. Anytime of the year, test your skills with the floating putt challenge, ropes course or fly high over the village on the Baytowne AdventureZone Zip Line. In the winter months, you can take the whole family ice skating at Baytowne on Ice. In March, the Wednesday Night Concert Series kicks off with a different musical act each Wednesday through the month of October, with a reprise in December for a special holiday edition. Visit our annual calendar of events for more details. Where is the Village of Baytowne Wharf? The Village of Baytowne Wharf is located on the Choctawhatchee Bay in Sandestin Golf and Beach Resort, free and open to the public. Even your dog is welcome, as long as fiddo's on a leash. With more than 12 restaurants, 15 retail stores and several nightlife venues, it has become the gathering place for everyone visiting, living or working along the Emerald Coast. There is a public parking garage and several auxiliary lots, including the Horseshoe Bayou parking lot at the Sandestin main gate, which shuttles guests to the Village during summer time and for special events. Parking is free to the public.